NPR has this fascinating piece on the custom microphone building threaded with history of Neumann Microphones. Neumann made the smooth-sounding U47 that the Beatles recorded on almost exclusively on from 1962 to 1970, as did Frank Sinatra, Ella Fitzgerald, Louis Armstrong, Bing Crosby, and others. When I say others, I mean Hitler. 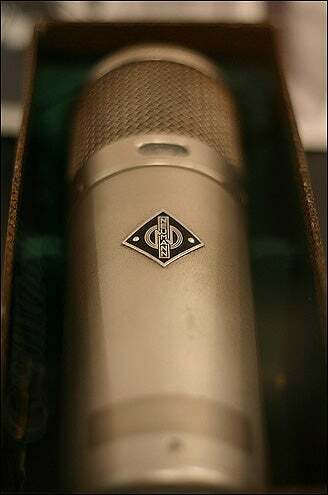 Before its glorious post war role as a tool for musicians, a Neumann bottle mic was used in 1936 Berlin Olympics as German Chancellor Adolf Hitler opened ceremonies on. Soon the Third Reich used the then groundbreaking clarity of the mikes to "not only transport the words and information, but...emotion." And so often was it used, it gained the nickname Hitlerflasche, or the Hitler Bottle. Neumann took the old carbon-grain broadcast microphone, which uses bits of carbon sandwiched between two plates, and turned it into a mass-produced "condenser" microphone, which has one fixed plate and another that forms a diaphragm moved by sound waves.